Rifkin Hasburg of Procyon Games brings us a strategic fencing game by Reiner Knizia. 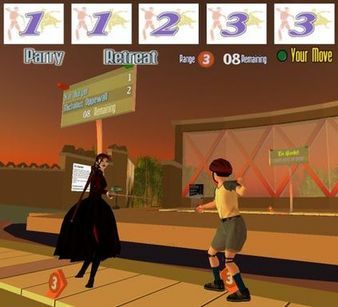 “En Garde” is a strategic fencing game similar to Combat Cards, but with some interesting quirks. A Fencing Tournament will commence September 30th at 5pm with over L$10,000 in prizes! Wanna play? Here’s the SLurl! I was sent this by Ultralite Design and haven’t been able to take it off my HUD since. It’s genius. The basic premise of Tiny Empires is that you’re climbing the social hierarchy. To do that you need to buy land, get subjects, and grow your empire. The subjects are other, newbie players… which means that at the beginning YOU will be somebody’s subject. That takes a bit because another player of a particular rank has to be logged on and playing in order to see that there are new subjects available. I had to wait about five minutes… and it didn’t really benefit me directly. You’ll get offers from “the king” to buy land occasionally, which is great because land means money. You’ll also get offers from other players to buy your land. If they’re offering you above fair market value, it might be worth it so you can buy more later at the regular price. More often than not though they’re offering you much less, so make SURE to turn them down! It’s time-based gameplay so what you’ll end up doing is hitting the little minimize button on it and quickly opening it whenever the indicator flashes to see what the latest offers are. I’ve enjoyed having it there while waiting for IMs to come in. You can pick up a free trial at Ultralite Design and get the full version when you’re ready. When you get the full version you can even hand out trial versions to your friends! I notice the group tends to be a blend of visits to corporate sims (hmmmm not unless there’s something really different happening, thanks) and cool stuff like this. So far, both the activities I took part in were fun. I took some really crap snaps – something has gone all wonky on my machine since I installed and de-installed the First Look viewer (which totally doesn’t work for meeeeeeeee *whines*) – so here’s a crap photo of Adec protecting his blue castle. Meh. Check out the group “The Game of Go aka Wei’qi aka Baduk” for more information about the club. Or contact me. Definitely check out the build, actually… has a nice airy feel to it. A Deck of Cards – OF COURSE! When Rifkin wrote me about this I had one of those smack-your-head-with-astonishment moments. Why the hell hasn’t this already been built? You have got to admire Rifkin Hasberg… the guy has vision. (Previously he built Frootcake, Danger Zone and Zingo). You can get your own copy here. From a business perspective there’s a bit of genius to it because all he has to do in order to sell more decks is re-texture the back of them. It’s kind of beta at the moment but you can play Hearts and Spades. MANY more games are promised. If you and three friends want to give it a try I have it over at the Games Park. If you can’t find a fourth, try your hand at 52 Pickup. Seriously. Couple more pictures after the fold… Read the rest of this entry ? This article was originally published in New World Notes. My newest column should be appearing there later today on Sunday. Second Life tends to be full of bling. Even the more grim RP communities can’t resist dipping their dog-collars in chrome and shining their samurai swords. After awhile this can all start feeling like a shiny happy Barbie landscape, and you need to get out. You need to go where things have truly, irrevocably fallen apart. Sometimes you need to go to the Wastelands. Welcome to the post-apocalypse. Read the rest of this entry ?